The event is akin to Black Friday and Cyber Monday in the U.S., but it is 2.5 times larger than both of those dates put together. Alibaba discounts a range of products across its online sales platforms, which include its Taobao marketplace, Tmall store for brands, AliExpress international services and — more recently — its global businesses. Those include Lazada in Southeast Asia and India’s Paytm, which counts Alibaba and Ant Financial as major investors. The sale covers obvious goods like smartphones, TVs and other big-ticket consumer items, but also fashion, clothing, furniture, health products and more. The less expected items that sell well include cleaning products, toilet paper and daily perishables. There’s also a strong demand for cars, among other things. In total, Alibaba saw 1.48 billion transactions worldwide last year, with a peak of 325,000 orders per second. Its Alipay payment service clocked 1.5 billion payment transactions, with total orders reaching 812 million. All the while, a dominant 90 percent of sales came from mobile devices — that’s well ahead of the U.S., which saw 37 percent during Black Friday and 33 percent on Cyber Monday. Alibaba is also pushing the festival into offline retail, which is in line with its own business, which has expanded into physical stores through its own Hema brand and partnerships with major retailers in China, such as tech giant Suning and hypermarket operator Sun Art. 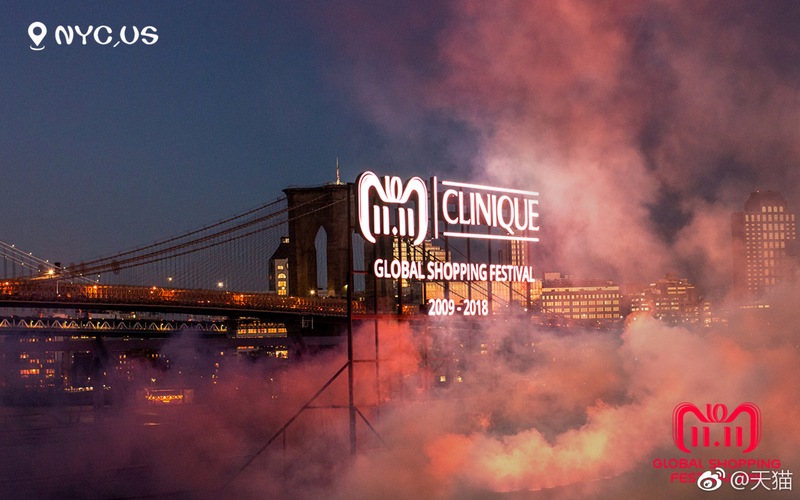 It was renamed to “11.11 Global Shopping Festival” in 2015 to reflect Alibaba’s efforts to grown the sales outside of its core market in China, and last year it claimed to have attracted more than 60,000 international brands with customers located across more than 225 countries. November 11 wasn’t always synonymous with buying discounted products online. The date first came to prominence in China during the 1990s when it was said to have been promoted as a bachelor celebration day because the date represents four “singles.” It later took on new meaning as a day to celebrate relationships — it is a hugely popular date for marriages — and find potential partners. 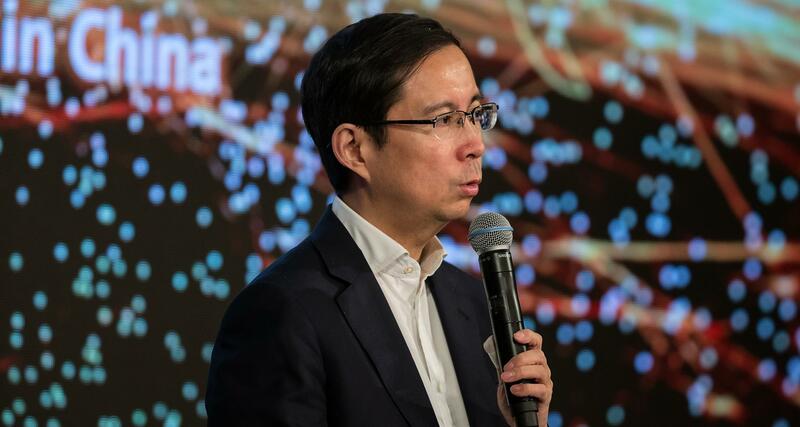 The e-commerce component arrived in 2009 when an executive named Daniel Zhang used the date to promote Tmall, Alibaba’s virtual mall for brands, with just 27 merchants participating. Zhang, then in charge of the Tmall business, is now the CEO of Alibaba itself and he will become the firm’s chairman when Jack Ma — Alibaba’s figurehead for many years — finally steps down from the business next year. Back in 2009, Alibaba grossed around $7 million on its inaugural Singles’ Day. Speaking to CNBC this week, Zhang said he “had never expected” that the promotion would become such a huge phenomenon for both Alibaba and the wider e-commerce industry. As Singles’ Day blossomed into a national celebration, other e-commerce players such as JD.com and Pinduoduo have also joined in to capitalize on a month of robust consumer spending. JD.com, for instance, saw a 21.1 percent uptick in active users for its mobile app on November 11 last year, according to market research firm QuestMobile. The event’s warm reception has also inspired competing festivals throughout the year. 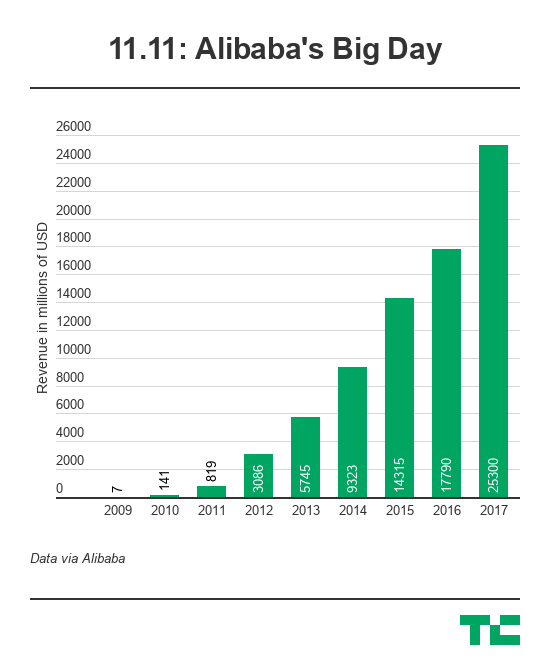 In 2010, JD.com, which ranked behind Alibaba in terms of transaction volume, runs its Singles’ Day festival over a 12-day period, and it started its own mid-year shopping event that falls on June 18. Suning, a major Chinese appliance retailer, has turned its August 18 anniversary into a sales event. 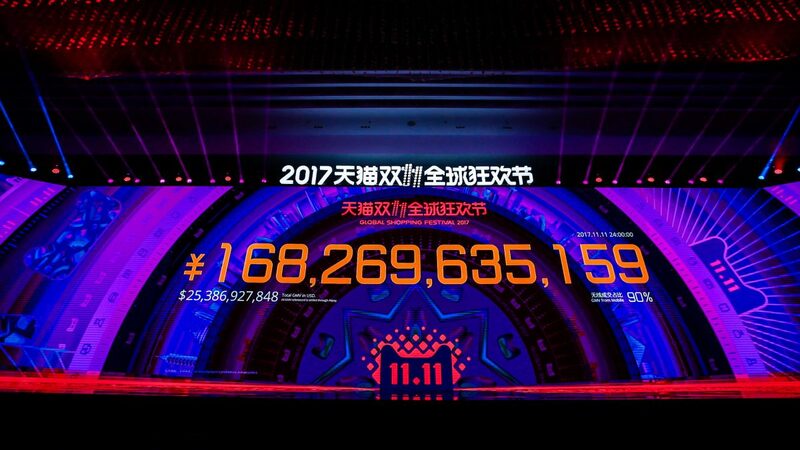 None of the latecomers have managed to match the scale of Singles’ Day, however, and Alibaba continues to extend the boundary for the world’s largest shopping event. Singles’ Day continues to grow bigger each year, but sales have slowed. Year-over-year growth in gross merchandise volume slid from just under 65 percent in 2014 to around 40 percent in 2017. But Jack Ma has always been keen to downplay the importance of these numbers. In 2013, he told Chinese media on the eve of November 11 that he wasn’t going after sales figures. He has reiterated a similar message in the succeeding years. Rather than scale, Ma said he looks for “steady” growth. That’s because the shopping spree demands an overarching infrastructure to power functions such as logistics and payments. Ma’s words are in line with the company’s ongoing quest for potential partners to power its retail ecosystem. Last year, Alibaba poured $717 million into Huitongda, which runs an infrastructure for online retailers to sell to rural customers — who also participate in Singles’ Day. Similarly, Alibaba’s financial affiliate Ant Financial has banked a number of payment solutions companies worldwide to support the e-commerce company’s global reach, while the firm’s cloud computing division handles the demands of selling $25 billion in goods each year. Then there’s logistics platform Cainiao Network, which helps handle the 812 million orders that were placed in China last year. Singles’ Day has also seen Alibaba adopt technology on a wide scale. Last year, it ventured into AR; Maybelline let customers try its lipstick virtually, Nike is among the brands to have used gamification to attract customers and Alibaba’s own Tmall service adopted “virtual fitting rooms” to help sell clothes. Alibaba Chairman Ma has also projected what would become a norm for Singles’ Day today. “We want all e-commerce companies to get involved, and all brick and mortar malls to be part of it,” he said. In 2016, Ma coined the term “new retail” to describe a future of seamless integration between online and offline retail sales. Last year marked the dawn of the shopping festival’s offline push. This year, 200,00 brick-and-mortar stores have signed up for Singles’ Day to make discounts available to Alibaba customers. A user can, for instance, get offline deals when she uses Alibaba’s Alipay e-wallet to pay at a mall. Alibaba also uses Alipay to give away cash prizes through red wallet competitions. Alibaba said last year that New Retail “showed promise” during 11.11, but it declined to provide figures. 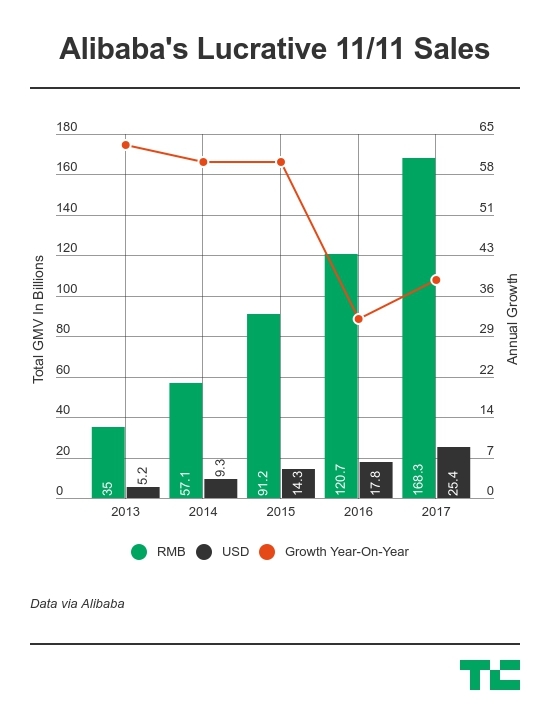 This year, given Alibaba’s physical retail advancement — it now operates more than 30 stores and includes facial recognition-based payment — the offline component will be more important than ever. 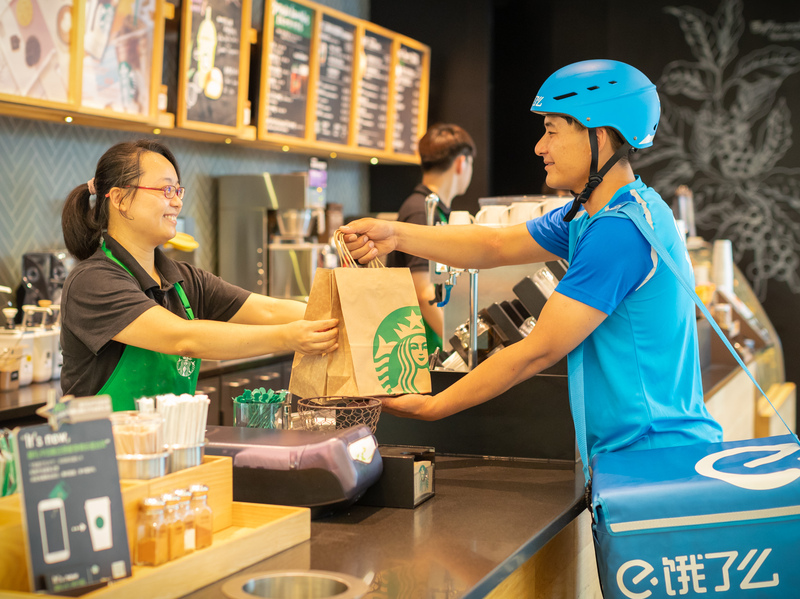 Beyond Hema and InTime physical shopping, that also includes Ele.me — and Starbucks deliveries — and the rest of its local services delivery platform. The forecast for this year’s Singles’ Day 2018 is challenging as it comes against the backdrop of China’s economic struggles and the U.S.-Sino trade war, which has seen billions in goods tariffed. However, the majority of Alibaba’s sales continue to be in China, both on 11.11 and the rest of the year, so despite its progress on international growth, the actions of the U.S. government are unlikely to be felt. Either way, Alibaba puts on a real spectacle for the world during 11.11. First up, there’s a star-studded entertainment show that takes place on the eve of the festival, and then you can expect constant updates from Alibaba’s Twitter account during the 24-hour period itself. We’ll also be following the latest developments for you right here on TechCrunch.com, so stay tuned for more.